After being away for 8 weeks, it's nice to be home with our old norm. Right before we came home, I ordered some layer cakes to be waiting. It was perfect timing because on the doorstep was the package from the fatquartershop with the Moda Blush and Gobble Gobble layer cakes in it. Yummy, but definitely not something that look well together! 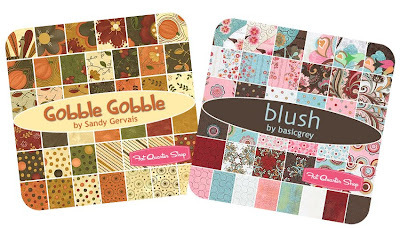 I really loved the fall colors of the Gobble Gobble so I gobbled them up on sale!! I'm hoping I just might get a chance to be crafty again and sew something this weekend since I'm back with the sewing machine!! But, keeping the patient well after treatment is still my first priority. DH did well with the treatment and now we just sit back and wait a couple of months for the results. Luckily, I'll have some sewing to keep my mind busy. With that, here's a snapshot of the fabrics in the package I received. Glad I got them when I did, I can't find them on the site anymore. I'm beginning to think that buying jelly rolls, and layer cakes on sale is better shopping than going to the shops! I also stalk the fatquarter shop for sales. Here in Canada they are very hard to find, so I shop online when possible. Nice to be home, I am sure.